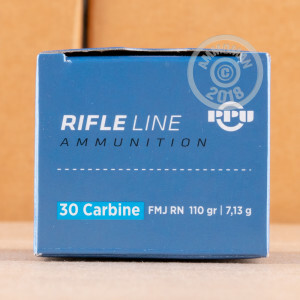 This 30 Carbine cartridge by Prvi Partizan sports a 110 grain projectile, which is the bullet weight the caliber originally offered when it was first introduced. The bullet’s full metal jacket makes it exceptional for long periods of training or target practice, as it will protect your rifle’s or pistol’s bore against the rapid accumulation of lead residue that would quickly worsen your accuracy. Along with its jacket, this bullet’s round nose means it will penetrate targets very well, but its inability to expand makes it less than ideal for hunting and self-defense applications. 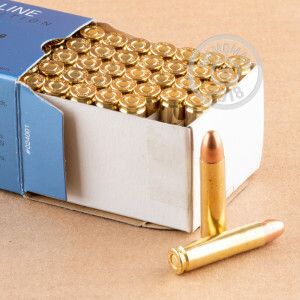 The Serbian manufacturer Prvi Partizan has nine decades worth of experience making high quality ammunition, and their rounds’ precisely formed and reloadable brass cases, sensitive primers, and reliably igniting propellant have made them a popular choice for a variety of applications throughout the world. If would just like a hard-working cartridge to load into your classic M1 carbine or Ruger Blackhawk, these 50 rounds are certain to serve you admirably. Great shooting and clean ammo. PPU, or Prvi is great quality ammo. One of the better imported brands. Much cleaner shooting ammo than the popular Russian and Mexican brands. I have both a .30 carbine rifle, as well as a .30 carbine semi auto pistol, and both of them "digest" this ammo well, and one can shoot for hours without having to strip and clean the firearm.